Click on any of the sections below to find answers to the most asked questions. Metal Building Depot has corporate offices just outside of Houston, TX. We have drop-ship distribution points for accessories and other building items throughout the U.S. providing you with the lowest possible shipping costs. See our contact page for complete details. We can be contacted 24 hrs a day on-line or fax. Calls are taken Monday through Friday, 8 to 5 pm CST. See our contact page for complete details. The number one reason is strength. Steel buildings can withstand high load conditions. Steel buildings are fastened together with high-strength bolts and screws. The connections remain secure because there is little to no movement in the structural members and panels. However, wood connections in conventional construction become loose due to expansion and contraction and the result is warping of the wooden frame. Steel does not warp, shrink, or change with time so the connections remain secure. Wooden buildings can suffer damage do to insects such as termites, and this deterioration will reduce the quality of wooden buildings. Furthermore, metal building material is not a flammable substance so your insurance costs will be reduced. How does the price of a steel building compare with others? Conventional construction materials are affected by demand and availability; conversely, steel has remained relatively constant for many years. When it comes to pre-fabricated steel buildings it would be difficult to find a like structure to compare with the low cost of a steel building. Is everything I need to construct my building included? Everything you need to construct your new metal building will be included with the exception of the anchor bolts, which should be supplied by your foundation contractor. It is the space between 2 frames. For example, the end wall of the building is the End-Frame, and the distance between the End-Frame and the next column/rafter section is the Bay Space, or the distance between two column/rafter sections. Steel building assembly couldn't be easier. We provide you with the necessary information to erect your steel building quickly and efficiently. Many of our clients erect their steel buildings on their own, although a professional contractor can also used at an affordable price. How much is my steel building going to weigh? The weight of your steel building is going to vary depending size. Your steel building quote will indicate the approximate shipping weight. If you're worried about unloading the steel building when it arrives, we'll let you know what you need to be prepared. How long will my steel building be guaranteed? We pass along the warranties offered from the steel manufacturers. Primary structural members typically come with a one year warranty that covers material defects. Steel sheets typically have a warranty of 20 or more years but varies depending on the color of the sheets and the local conditions. Are the steel buildings painted? Yes, the walls and trim are painted with a long-lasting factory-applied paint manufactured by a leading manufacturer of heavy duty, high performance protective coatings for steel building components. There is a wide selection of colors for you to choose from. You can select the wall panel, trim, and roof colors on the color chart section of our website. The base trim that you choose for your steel building will depend on your building's needs and the type of foundation you use. Although we strongly recommend a notched base, we do offer several additional base trim options to suit your specific needs. Please see base conditions for more helpful information and illustrations. We offer a selection of windows for your building. To learn more about what's available please visit the accessories section of our website. What type of doors do you offer? The doors we offer range in size and feature. Please see the accessories section of our website for more helpful information. What comes with the doors and windows? 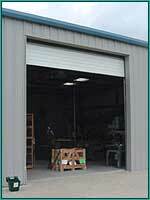 All of our doors and windows come with the required hardware to install them into your steel building. We provide the framing, trim, and flashing for a proper installation. How do I know where to place my windows and doors? Windows and walk doors are generally "field located." You, as the customer, will pick the location, cut the corresponding panel to size and proceed to mount the doors and windows. If you choose to include a large number of windows or doors we may ask you to give us your proposed location to ensure proper building bracing. How do I attach my doors and windows? All of our walk doors are self-framing, so they include the necessary items to mount them on your building. Our windows are secured by screwing the window trim directly into the building. This is also known as self-flashing. If you live in a high wind area, please talk to one of our design consultants about additional door and window mounting options. What is the R-Value of your insulation? The r-value of our insulation depends on the thickness you choose. It will vary between R-10 and R-19. Please see the r-value section of our website for more helpful information. I already own a steel building and would like to add to it, can you help me? Absolutely. Log on to our special quotes page or call to speak to one of our building estimators to find out how easy and cost-effective steel building additions can be. Do I need a building permit to build my metal building? You will almost always need a building permit. On occasion you will not need a permit to build but you should ALWAYS check with your local building inspector before purchasing a metal building. When I call my building inspector what should I tell them? When you get in touch with your building inspector let him know what you're planning and you should be able to receive the information you'll need to get a building permit for your new metal building. What do I do if I need permit drawings? We supply the permit drawings to you after you have committed to buy a metal building from us. We will not begin fabrication or shipment until you have completed the approval process. See the Approval Process section of our website. What about building codes and loads? Every metal building that we ship is engineered to comply with regional building codes, wind load and snow load requirements (as stated on your plans). When you start designing your metal building, make sure to review your building code specifications very closely. Since there can be varying requirements within regions - you will need to confirm the codes by contacting your local building official. MetalBuildingDepot.Com is not responsible for confirming codes. Do I need a foundation for my metal building? Some people choose to pour a full slab foundation, however if you're planning on leaving the floor in a dirt or gravel condition, concrete piers will do the job just fine. Please contact a customer service representative if you don't plan to pour a full slab foundation. Can you provide an engineer stamped foundation layout? Yes, but in some cases your soil conditions play a major role in the type of foundation you can use. Contact our special sales department for more information. If using a local engineer, we will provide anchor bolt plans to aid your engineer in designing the foundation. Do you supply the hardware to attach the frame to foundation? No, the anchor bolts are usually supplied by a concrete contractor and placed when the foundation is poured. How long does it take to get my metal building? It usually takes between 4-8 weeks for your metal building to arrive after the order has been placed. MBD.com will supply you with a estimated delivery date upon order and a guaranteed date after fabrication. How do I unload my metal building? In most cases you'll need some heavy equipment (forklift) and a few helpers to get the job done. Everything will arrive at once so be sure to have your location prepped for material. After unloading your metal building be sure to do an inventory of ALL of your items, and let us know immediately if anything is missing. The amount of time to report missing items is limited to 5 days due to job site theft. What if I'm not ready to put the metal building up when it gets there? Your materials can be stored. Be sure to look over the information included to properly care for your wall and roof sheets. Please see UNLOADING AND STORING your building for more details. We keep costs as low as possible. Your costs will vary depending on the mileage and the weight of your metal building. 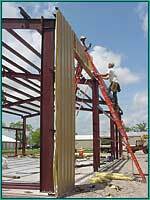 Do I need a professional erector to put up my metal building? 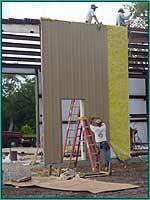 A majority of our clients choose to erect the metal buildings themselves. Your package includes detailed erection drawings and an erection manual with every metal building shipped. We design every metal building to be erected easily. If you do not feel comfortable erecting your own metal building, a local contractor can do the job for you at a relatively low cost. What if I have questions during the erection of my metal building? We're here to help. 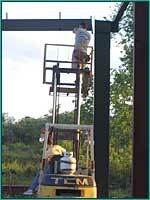 We have professional metal building erectors on-staff and they will always be available for your questions. No. Recommending metal building erectors is difficult because we cannot guarantee the quality of their work as we do our own. Check around and you should be able to find a qualified metal building erector in your local area. The time it takes to erect your metal building will depend on the size of the metal building, the size of your crew, and the skill of the workers in your crew. It can take as little as a few days. You can view a copy of our terms and conditions here. How do I pay for my steel building? You can finance your steel building through our preferred vendors. You can pay in full by check, or wire transfer. Your steel building will require 2 separate payments; the first is an engineering deposit (25% of your steel building cost) payable by e-check, credit card or electronic transfer. The second is due upon building delivery and it must be paid with a bank cashier's check. Your load will not be released until payment is made. You can make changes to your steel building provided it has not been released for fabrication. However, since we strive for quick delivery times, on some occasions there are delays and additional drafting and detailing fees. Who do I contact for technical support when using your website? If you have a question of comment about the website please click here to send an email to one of our customer representatives. When I submit my email address with your form what happens to it?